Is it possible to loop the programmed note sequence? I messed around with it but due to my limited programming experience I couldn't get it to work properly. Any ideas? Thanks! That's one of the very first programs I adapted for miniMO (source is here). I added several features to the program, but decided not to release it until I had a good amount of original/modular-related programs published. I think those two conditions are now fulfilled, so give me a few days to review the program, and I'll come back to you with an answer (I think it's possible, yes). Awesome, thanks! I'm curious what the features will be! In the following days I'll update the main website and document it properly. You can include several tunes, and advance from tune to tune, rewind a tune or rewind the whole lot; you can set a tune to auto repeat, and also change its tempo. The tunes are all written in AMPLE notation. I will write a post about this notation, including a link to a google spreadsheet I made to help me work with it. You’ll find tunes of various levels of complexity in the program, both to show what can be done with it and to help understand how to write your own music. Woohoo! Awesome, exactly what I wanted plus extra features! I think I can mess around with the example AMPLE. There were apparently resources in "Acorn Magazine" for the BBC Micro's version. Awesome! Beware though that the program implements the main features of the notation only -I would expect that only the first examples work. That's not to say you can't do complex stuff (see my own examples), but it's not as straightforward. 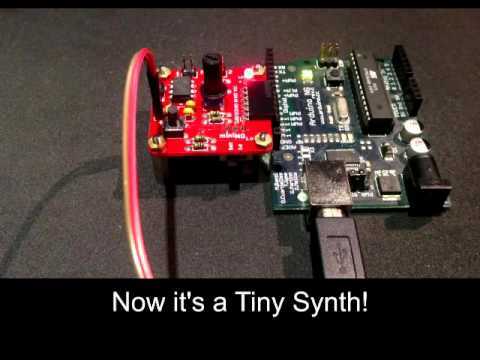 The authoritative documentation here is the original article on TinySynth, which is very clearly written. The whole site is fantastic btw, completely worth bookmarking. Also, I've just uploaded a new version of the program that adds a Continuous Play Mode. If you place a jumper bridging the pins in I/O 4, miniMO will go through the whole playlist rather than stopping between tunes. I've also finished writing the manual, and made lots of changes to make it easier for people to work with the playlist. That new feature is great! Thanks for that. I'm excited to mess around with it. And yeah, the examples of AMPLE I found were much more in depth than needed, but the general syntax is there for example. The original article you posted is probably the better option though, I forgot about that one! I've also made available a spreadsheet to help with the complex examples: take a look here. I'll write a couple articles to put all this information together coherently. Ha, I thought I was going crazy about the tempo. I'll check out the doc! Thanks for all your hard work, you have gone above and beyond!